Garden & Sky – "A garden to walk in and immensity to dream in…"
"A garden to walk in and immensity to dream in…"
Here we are on the last day of September, and weather-wise, it could be any day in early June. Except better, because in June you don’t have the crisp feel of the air as it blows through the drying leaves, sending them fluttering to the ground like golden confetti. You also don’t have the golden tint to the light, perhaps enhanced by the changing color of the leaves or the decreasing angle of the sun. And wafting through the air there is the faint smell of dried leaves and smoldering fires. It’s definitely autumn, but it’s warm enough to be early summer… a day to be savored. 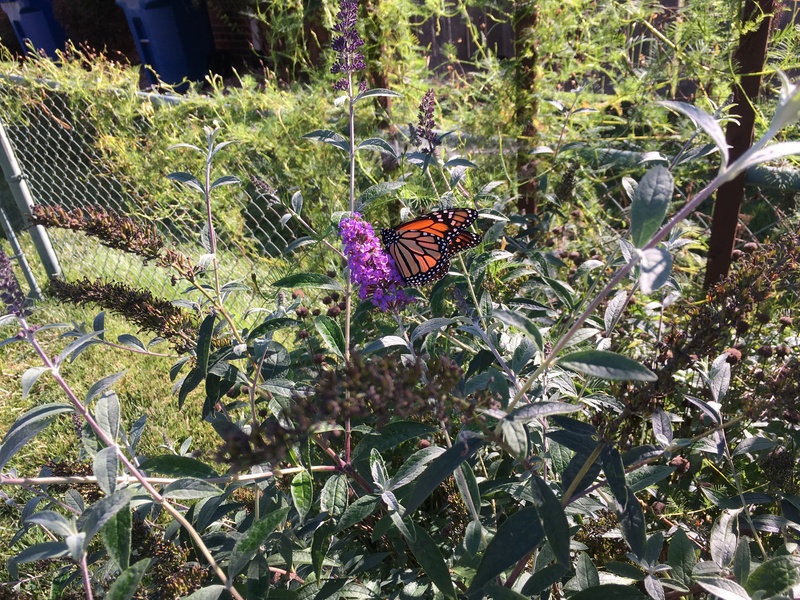 Out in the gardens, the monarchs still fly from flower to flower, but now with a sense of urgency. Most likely it’s my own mind silently urging them to quickly eat all they can and head south before the weather changes. The hummingbirds are still here, too, although it’s hard to know if they’re the same hummingbirds that I saw last week. The tree frogs still sing and the mosquitoes still bite; summer–in its early fall form–is still here. 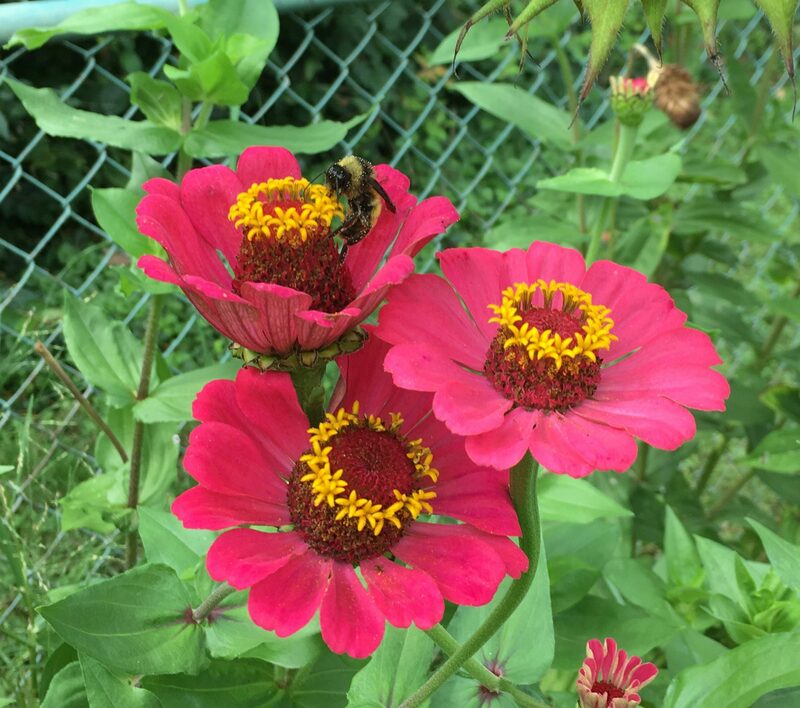 Our gardens continue to bloom, with the zinnias showing their usual impressive staying power and the marigolds exploding with rusty-orange blossoms. We’ve solved a few mysteries, too. In letting some of our garden areas “go native,” we inevitably end up with a few plants that we can’t identify… at least not at first. Early this spring, two plants grew quickly in our gardens. 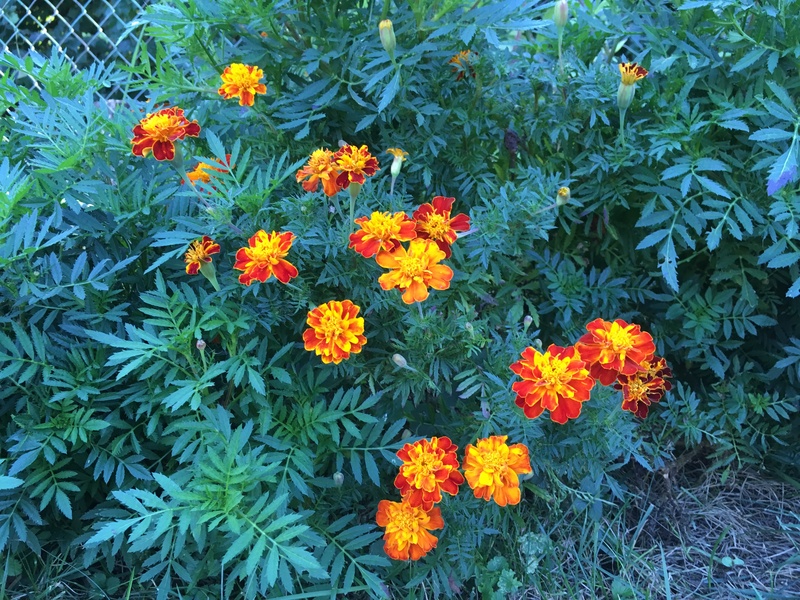 In past years, I would have said, “oh, weeds,” and pulled them immediately. But this year, in the spirit of gardening adventure, we decided to let them grow and see what they would become. Even though they were familiar-looking “weeds,” we didn’t know what they were. So, we waited. And we waited. And the plants grew and grew. 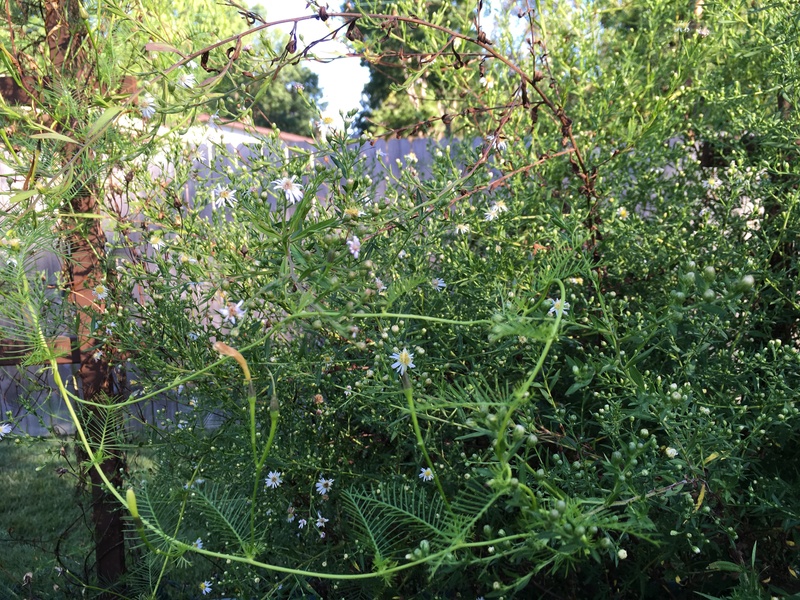 By the end of July, they showed no signs of blooming or even forming buds, and the leaves had been no help in revealing the plants’ identities. By the end of August, there was still neither bud nor bloom. 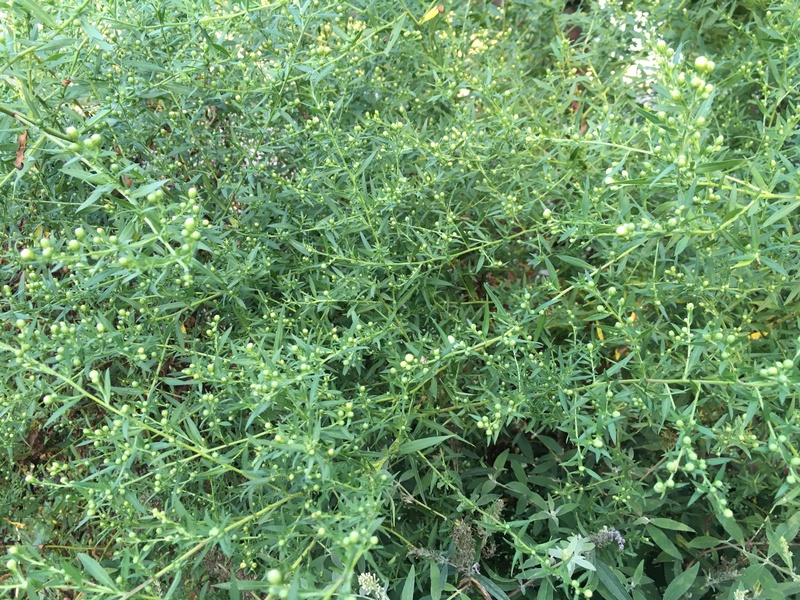 Finally, around mid-September, there were signs of both–extremely tiny buds on one plant, and faint yellow flowers on the other. 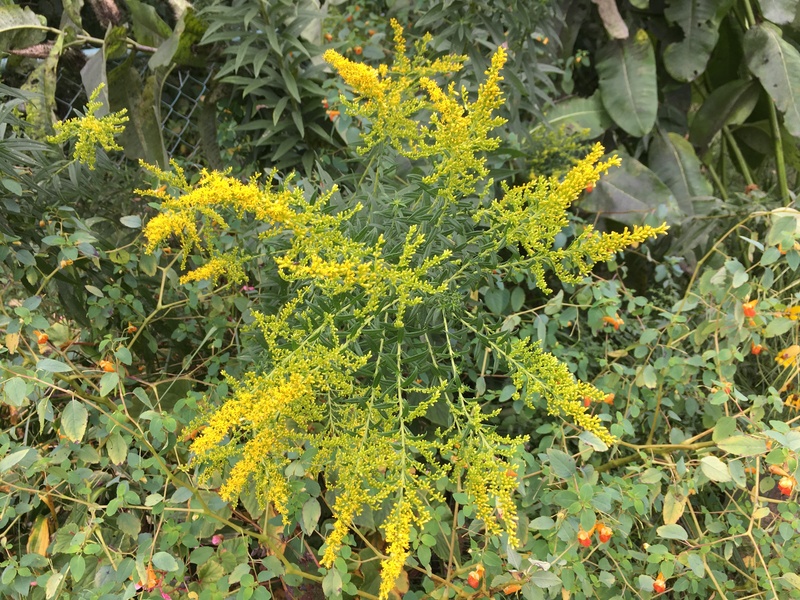 The yellow one is, of course, goldenrod, and what a spectacular plant it is! It has produced a spectacular array of tiny yellow flowers, often looking like Nature’s own fireworks display. The other one, more subdued but still beautiful, is the white aster. Slowly but surely, this plant is becoming awash in dainty white flowers. In another week, it will be fabulous. Love the late bloomers! We had a real surprise this morning. 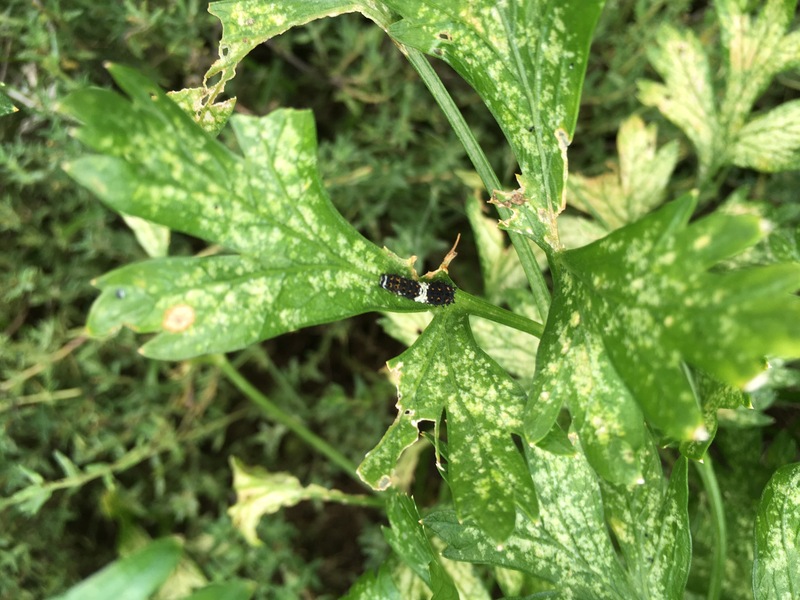 As I was looking to see what happened to our compass plant (it just didn’t do too well this year), I noticed some bright white densely clumped flowers among the tall grasses. 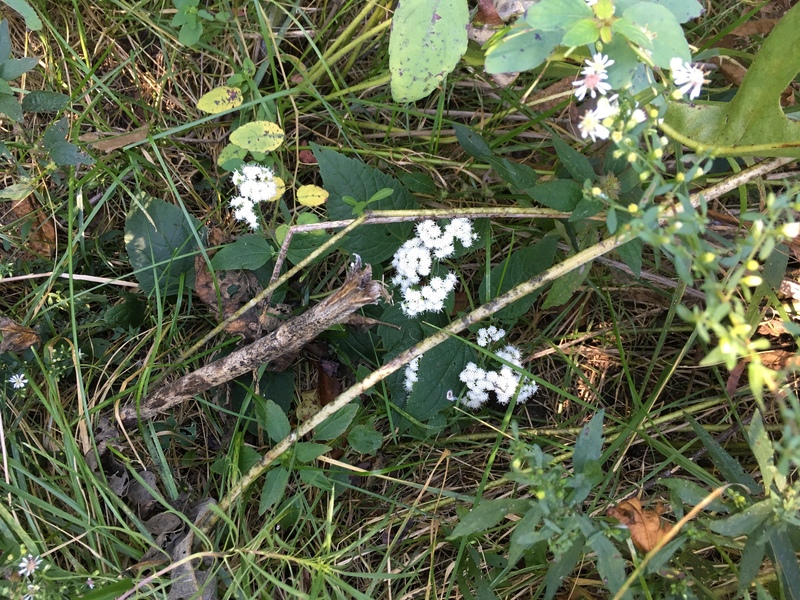 I had seen these before–white snakeroot! This was exciting because we had not planted it (like the jewelweed… see earlier blog post) AND it has an interesting story/legend attached to it. The calendar says September but the backyard says August. It’s mid-afternoon on the third day of sun, 90s, and humidity, but I still need to venture out and spend some time on the back patio. The neighbor’s lawn mower drones ever on, but I can soon ignore that and focus on the soft breeze swishing through the yellowing cottonwood leaves and the cicadas buzzing away high up in a nearby tree. In the dark cool of the back woods, the crickets chirp softly. It is still summer. But it’s not the lazy kind of summer afternoon like you might experience in late July or early August. In September, there is a sense of busyness and focused energy. The gardens are alive with movement as bees, butterflies, and birds flutter and swoop from bloom to bloom. 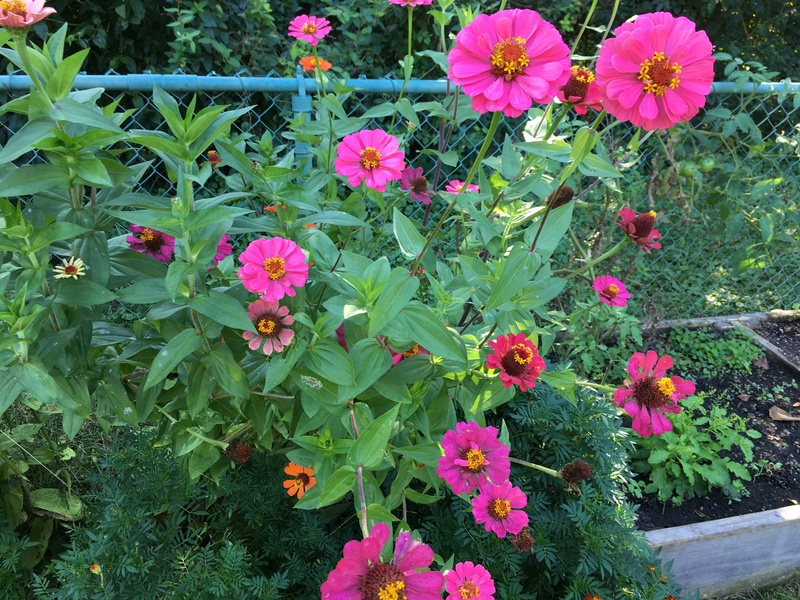 Each flower nods its head in welcome as the pollinators land. Sunlight catches the quivering wings, and I can see flashes of light and color constantly weaving in and out of the green leaves. It’s a mesmerizing display. I’m not sure if these seeds are mature enough, but we’ll save them and plant them next year. Who knows? It’s all an adventure, a kind of fun experiment. 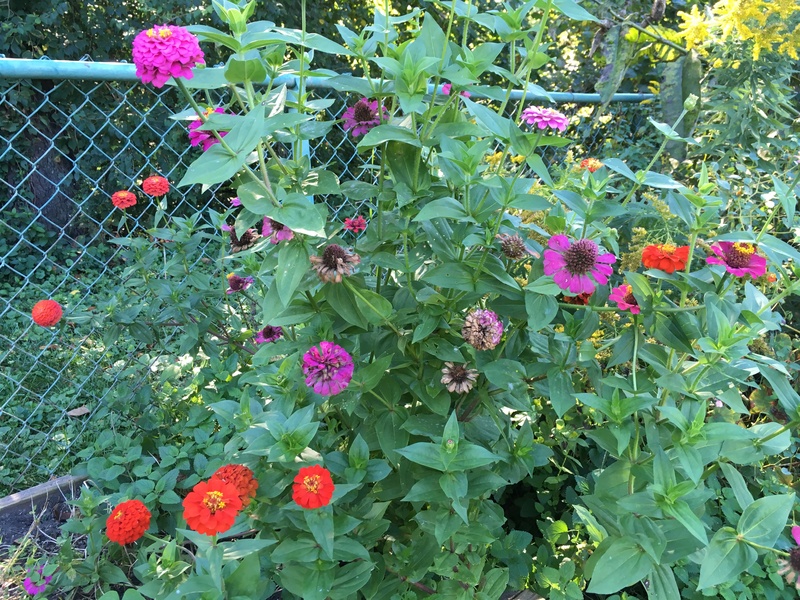 It’s an amazing thing to think that each of these huge tree-like flowers came from a small seed that we planted. And now, each plant has produced at least five to eight flowers with each flower loaded with hundreds of seeds… wild! 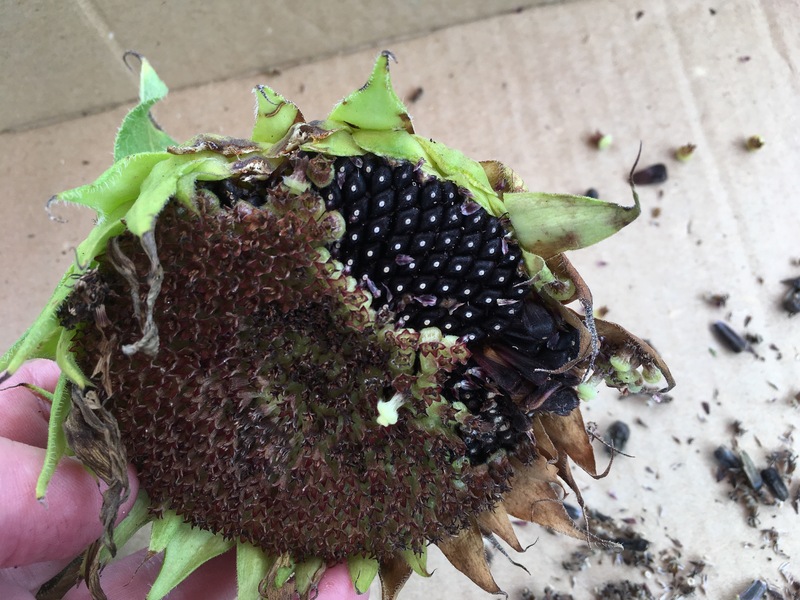 If I can be patient, we should have a whole field of sunflowers next year! Along with collecting seeds, I’ve spent a little time this weekend harvesting herbs. One goal here is to make it through the winter without having to buy any. We haven’t quite succeeded with that, but this year, we may come close. Another goal, of course, is to experience the great satisfaction from using something that we’ve grown and produced ourselves, stocking our shelves with home-made goodness. I think we’ve succeeded with that one. 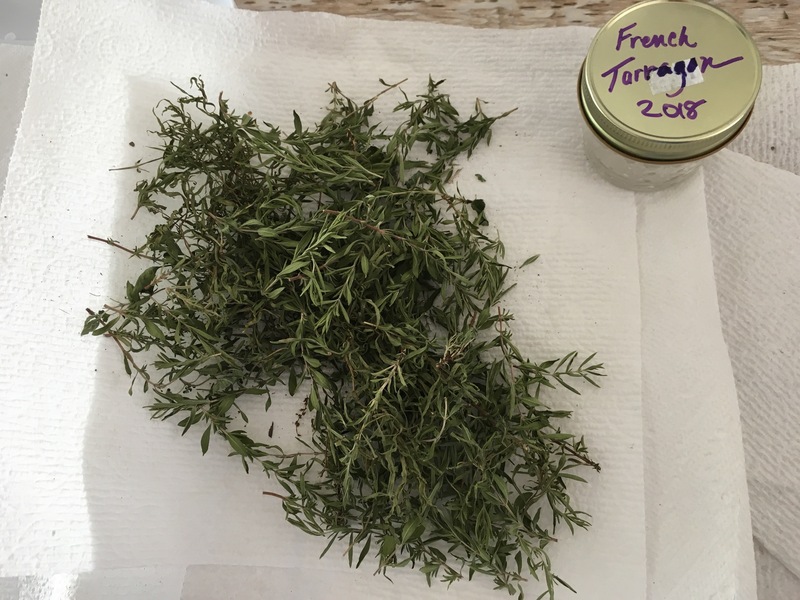 We’ve got lots of herbs growing, but for this weekend’s harvest, I focused on thyme (my favorite), French tarragon, and flat-leaf parsley. 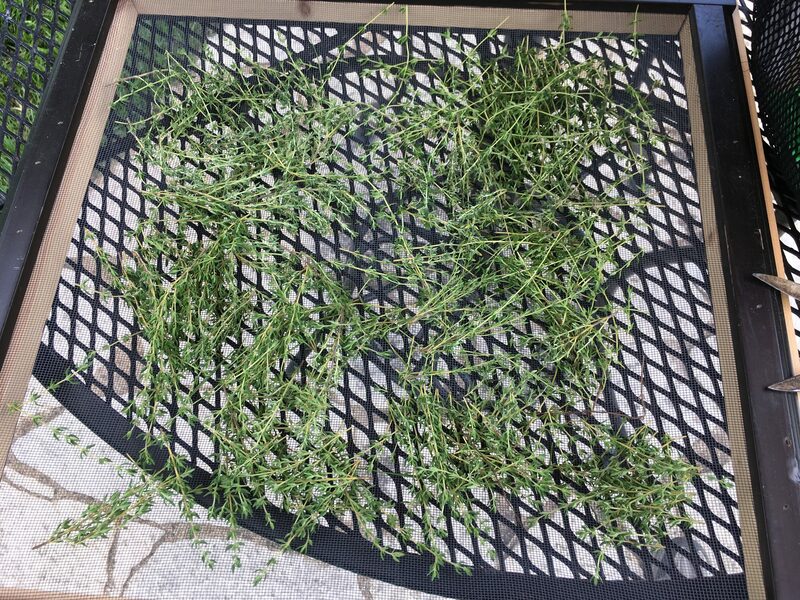 We always run out of dried thyme over the winter. During the summer, we use it fresh on salmon–wonderful!–and never run out. In the winter, we sprinkle the dried version over fish and in soups and there never seems to be enough. So now, I’m cutting and drying as much as possible. 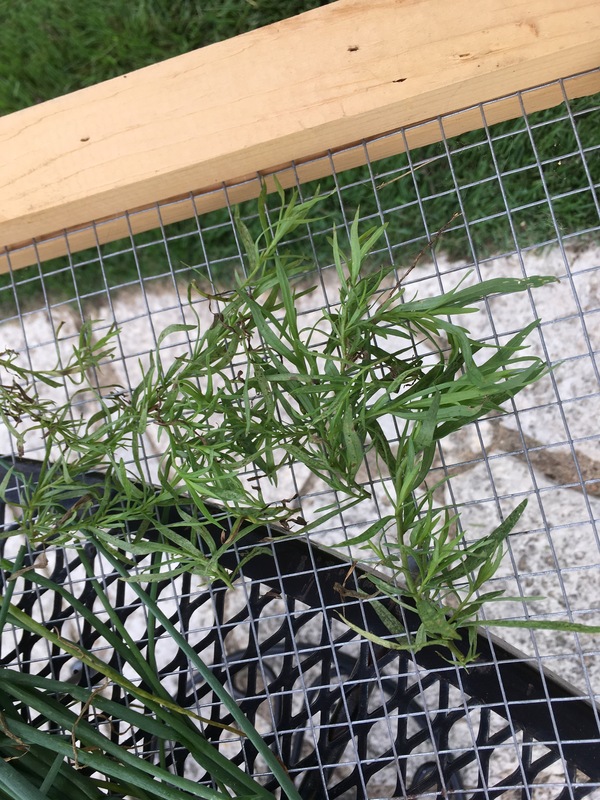 Our French tarragon plant is on its second year and struggling a bit, so we don’t have as much as we’d like. I love to use it (fresh and dried) in scrambled eggs. There’s not much to harvest, unfortunately, but every delicious little bit helps; I need to remember to buy more plants for the spring. 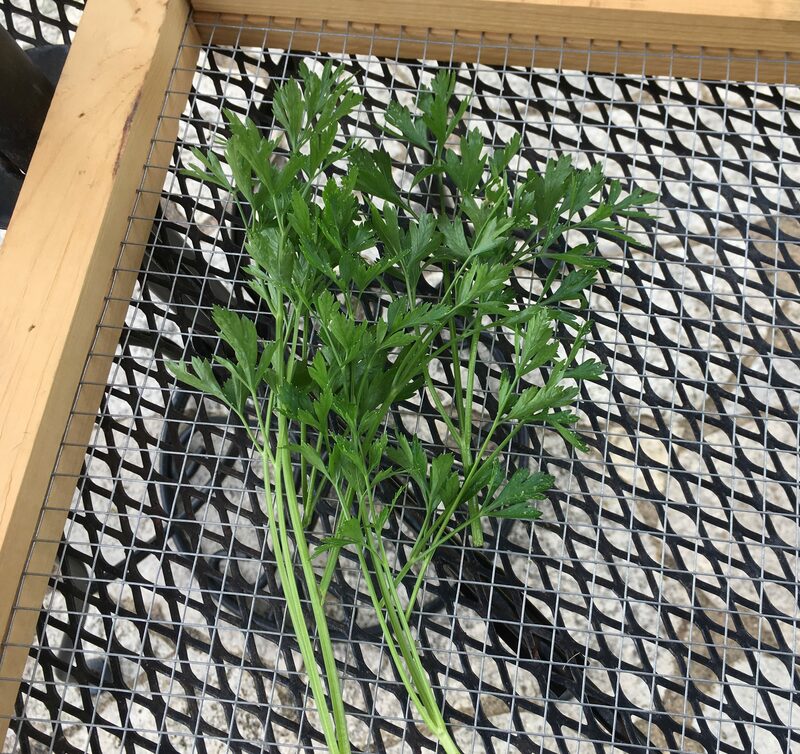 The black swallowtail butterflies love the parsley as much as we do! Before we take any, we examine the leaves front and back, looking for eggs and caterpillars. It makes harvesting a challenge, and really reduces the amount of the plant that we can use, but it’s worth it! After the herbs are dried, they go into glass jars and into the cabinet… ready for the next time Joe is whipping up some scrambled eggs, baked salmon, or linguini Alfredo. Enter your email address and click button below to follow this blog and receive notifications of new posts by email.